Brand : Regina Part Number : 5ZRP/108-KHO010 Product Specifications. Front sprocket, rear sprocket and a precut chain make a convenient kit for the dealer or consumer. 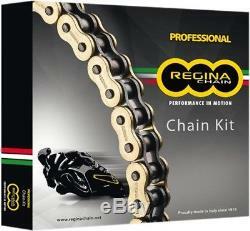 Chain is Reginas high-performance Z-ring series with gold outer plates and Z40 sealing rings, which dramatically improves performance and wear life; includes both clip- and rivet-type masterlinks. 520 conversion kits include all the above, but the rear sprocket is aluminum rather than steel, which in some applications reduces the chain + sprocket weight by as much as 2.5 lb. The item "Regina 520 ZRD Chain and Sprocket Kit 520 Conversion Kit - 5ZRP/108-KHO010" is in sale since Wednesday, November 14, 2018.